$45.00 "Order of Lenin. Order of Stalin (Project)", Valeriy Durov. C. 2005, Moscow. Russian text. Large format hard cover, 143 pp, fine quality. Large format Russian language hard cover, 143 pp, fine quality. Color detail photographs, front and back, of all known variations, as well as detailed history of the award. Outstanding reference guide to the highest Soviet decoration. 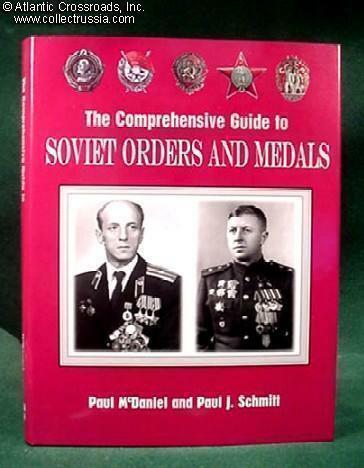 $5.00 "Orders and Medals of the USSR" A handy and comprehensive illustrated guidebook to Soviet military and civilian awards. English language. $35.00 "Orders and Medals of the USSR", Moscow, Planeta Publishing House, 1982, Russian text, 239 pp hard cover in a large 6 5/8" x 10 3/8" x 5/8" format with original dust jacket, includes close-up photos of Soviet "Republican" orders. Only one used copy in excellent condition available. $85.00 "Awards of Soviet Republics" by N. Strekalov and I. Sysolyatin. The book covers the early "republican" orders and medals which predated (and for a while coexisted with) the federal, Soviet Union awards. This massive 640 page volume is sure to become the final word on the subject. An absolutely incredible and indispensible reference! Russian text. $70.00 "Echoes of War. Researching Soviet Military Decorations" Paul J. Schmitt,	C. 2006 . English text. Hardcover with dust jacket. Features the widest published collection of Soviet awards' serial numbers and awarding information. Limited printing of just 1500 copies. Brand new copy in mint condition, hand-signed by the author. $25.00 "Legal Code of State Awards of the USSR", Moscow, 1987. Russian text hardcover, b/w photos. Unlike most other books on the subject, shows medals for Soviet honorary titles such as People's Doctor and Honored Pilot of the USSR. Scarce Soviet era reference in near mint condition. $175.00 "Orders and Medals of the USSR, 1918 - 1991", Two Volumes, by Sergey Shishkov and Mikhail Muzalevsky, C. 1996. Massive hard-bound volumes with dj, English and Russian text. Out of print set in excellent unused condition. $90.00 "Heroes of the Soviet Union" massive 2-volume set, Russian Text, Moscow, 1987. This out-of-print official publication is the ultimate guide to the Heroes of the Soviet Union! Includes capsule biographies of every Hero Star recipient, portraits and a brief description of the feat for which the Title of Hero was given. $99.00 "Heroes of the Soviet Union", V. Vorbyov and N. Efimov, 2010, St. Petersburg, Russian text, 638pp, oversized laminated hardcover with 35pp of color and B/W illustrations. Invaluable research aid filled with serial numbers and other information never previously available! $90.00 "Cheka, the History, Organization, and Awards of the Russian Secret Police and Intelligence Services 1917 to 2017" by Robert Pandis, 2017 Hard Cover Edition, 422 pp. English text. The book's primary focus is on the awards, documents and credentials of Soviet NKVD, MVD and KGB State Security; however, its scope goes beyond that and encompasses the awards of the secret police of other communist countries as well as post-Soviet Russia. It also details the structure of both Soviet and Russian State Security. At five times the size of the previous softcover versions, it includes a large number of high definition photos of original artifacts plus a vast amount of information. An excellent resource for collectors or historians. $45.00 "Cheka, Soviet Secret Police Awards, 1917-1995" Robert Pandis, new and improved 2012 edition. This book covers all variations of the most significant badges of Soviet State Security and Police, including the 5th , 10th and 15th Anniversaries of Cheka, Honored NKVD Employee, Honored State Security Employee and much more! This is the first book of its kind in English. $75.00 "Space Exploration Awards", Volume II Part 1, by V. A. Amelko, C. 2007, Moscow, in Russian and English (fully translated). This volume covers a multitude of medals, badges and table medals awarded by the Soviet and Russian space industry. Superb out of print reference, nicely published h/c with dj, a brand new copy in mint condition. $115.00 "Badges of Distinction of the Economic Agencies of the USSR, Volume 2", A. Zak, V. Alekseev, Ekaterinburg, 2010, Russian text, 368 pages, hardcover; covers badges issued by all-Union ministries, economic committees, industrial agencies, etc., from 1946 to 1991. $10.00 "Awards of the New Russia" Illustrated guide to Russian medals and orders instituted since the end of the Communist Regime. Large format hardcover of excellent quality, Russian text, illustrations life size and in color. $24.00 "Orders and Medals of the Permanent Presidium of the Congress of People's Deputies of the USSR. Main Types and Variations; Award Procedures", by B. V. Airapetyan. Russian text h/c, 99 pp. Much awaited book on the curious "alternative" award system that existed in Russia from 1994- 2010 under the auspices of the otherwise powerless Congress of People's Deputies, a rudimentary legislative body of the former USSR. These awards are mostly known as Umalatovskie by the name of the Congress' Chairwoman Sazhi Umalatova. $45.00 "Award, Historical and Journalistic Almanac".Issue #2, 2005.Russian text, hard laminated cover, 8.5"x11.75", 211 pp. Collection of essays on Russian and Soviet awards. $150.00 "Avers 8 - Catalog of Soviet Badges and Jettons", 2008, V Krivtsov, 736 pages, Russian text, 8 ¼" x 10 ½" x 1 5/8" thick; The latest in a long running series of reference books, this incredibly comprehensive volume (5,000 items) contains the highest quality color images of Soviet Badges and Jettons available anywhere today. $20.00 "Soviet Second World War Veteran Badges", Paul Schmitt, C. 2008. English text, soft cover w. gloss finish, 79 pp., over 400 color photos. Brand new copy in mint condition. $45.00 "Sport Societies of the USSR, 1917 - 1941" D.Nikitov, V. Kudryashov, B. Goldman. C. 2005, Moscow. Russian text. Soft cover, 76 pp, over 350 color photographs of badges and ID cards. Excellent guide book. $30.00 "Breast Badges of the USSR of the Era of Labor Victories, 1920-1940" In Russian, extraordinary reference, with superb extreme close-up photos of over 350 badges, obverse and reverse. $35.00 "Conversations of Phaleristic, Excerpts of History of Award Systems", Igor Vsevolodov, C. 1990, Moscow. Russian text, laminated hard cover, 336 pp. $75.00 "Stasi Decorations and Memorabilia" subtitled "A Collector's Guide". Ralph Pickard, c. 2007, English language text, 248 pages, fully illustrated in color. Complete guide to medals and documents issued to DDR's notorious internal secret police force. $75.00 "Stasi Decorations and Memorabilia" subtitled "A Collector's Guide", VOLUME 2,	by Ralph Pickard, c. 2012, in English. Big format hard cover with d/j, this 599 pp 2nd volume is even bigger and better illustrated than the first. The book covers foreign awards to Stasi operatives including Soviet Orders and KGB badges, uniforms and rank structure of DDR MfS State Security schools and uniformed Stasi military units, East German youth and sports organizations affiliated with Stasi, Felix Dzerzhinsky memorabilia and much, much more. Only 750 copies in print, each copy is individually numbered. This book may soon become an out of print collectible in its own right! $79.00 "Stasi Decorations and Memorabilia, VOLUME III" by Ralph Pickard, c. 2018, in English. Large format hard cover with d/j, this 318-page book is even better illustrated than the previous two volumes ! The photos and amount of information in it are simply mind-boggling. Its focus is cooperation between Stasi and State Security services of other Eastern Bloc countries; consequently, it shows many award groups issued to state security officers of Warsaw Pact that include DDR decorations and medals. The book also contains a number of Stasi documents, badges and non-portable awards that did not appear in the previous books, as well as rare photos of MfS special operations units during their training. There are only 750 copies in print, so this amazing reference guide may soon become an out-of-print collectible in its own right! $110.00 "Military and Civil Awards of the Democratic People's Republic of Korea (DPRK) ", Warren Sessler and Paul McDaniel, 2009. ENGLISH text, 406 pages, large 12" x 9" x 1 6/8" thick hardcover format with dust jacket. Highly recommended!